If you look carefully at who’s visiting your flowers in the spring and summer, you’ll soon spot a range of subtly different and equally beautiful bees alongside the industrious honeybees and the avuncular bumblebees. We have 250 species of ‘solitary bees’ in the UK – far more than the social species combined and a number of these can be encouraged to nest in your garden through provision of pollen, nectar and a place to stay! A number of different species can be found using bee hotels. One of the most common, and most widely provided for, is the red mason bee. These rusty coloured bees, around the size of a honey bee, are on the wing from March to July and will readily take up residence in a well constructed bee hotel. The females visit ‘mud mines’ where they gather up balls of soft mud to line and seal the individual cells within the nest tubes. They are a welcome visitor to any garden, especially if you have fruit trees, as they are a prolific pollinator, estimated to be over a hundred times more efficent than the honey bee. A number of the other Osmia (mason bee) species are also likely to pay a visit if the conditions are right. The photograph below shows a red mason bee feeding on green alkanet – a great source of early-season nectar for spring bees. As the year progresses, leafcutter bees emerge in the summer. These are so named for their habit of cutting circles of leaf from species such as roses which they use in a similar way to the mason bees – to line their nests and segregate the cells. A good garden can provide the leaves they need to line their nests; the nest tubes themselves; and a good source of pollen and nectar for the adult bees to feed on. 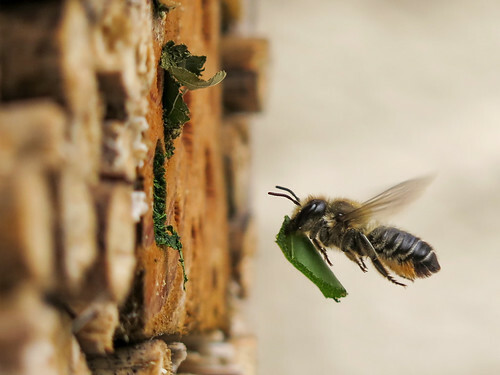 The photograph below shows a brown-footed leafcutter – Megachile versicolor – visiting our bee hotel last year with a section of leaf ready to line its nest. Alongside the charismatic species such as bees, you might also get some less charming but equally intriguing species. Last year, one of the nest tubes in our bee hotel was used by a willow mason wasp who hunted and paralysed beetle larvae to bring back to its nest. But a word of warning: don’t expect the hotel to be free of uninvited guests. The life history of bees is a complex one – they have ‘enemies’ including other bees (often named cuckoo bees), flies and wasps which will parasitise and exploit them. This is all part of the ecosystem which has developed and whilst you might feel protective towards your bees, you should bear in mind that the parasitic species is generally rarer than its prey! The photograph below shows a wasp using its long ovipositor to inject its eggs into the nest tube of one of the solitary bees in our garden bee hotel. It’s worth bearing in mind before you begin, just what you are aiming to do in creating a bee hotel. The species who are most likely to be attracted to the hotel are those which nest in cavities naturally; these include dead plant stems, holes in decaying wood often bored by beetles, and holes in brickwork. What you are seeking to do is replicate and ideally perfect these conditions for your garden visitors. Whilst there are many purpose-built boxes on the market these days, the nesting opportunities are easy to make yourself and understanding what you are tying to achieve can open up lots of opportunities to be creative. You could create the features within existing woodwork in your garden, say a fence post in a sunny spot or an old sleeper. Similarly you could create several small hotels of just the right size and shape to fit in with your existing materials in different locations around the garden. The additional advantage of multiple small hotels is that you are avoiding a dense congregation of nests, which may be more susceptible to parasites and ‘enemies’ and thereby maximise the chances of your bees successfully rearing broods. You can use lots of different materials, but do remember that wood treated with chemicals may be harmful to bees so certainly avoid anything freshly treated. Offcuts of old wood can be good though, along with logs, bamboo canes and other similar materials. You need your materials to be a minimum of around 8 inches deep, but some variation can be fine. We have had bees happily nesting in holes in fence posts where old screws have come out, but if you are making a bee hotel from scratch, you should aim to ward off any potential hazards. Aim to make your structure rain-proof – this often means constructing a simple box within which to place the nest tubes and put on a sloping roof which overlaps the top. This will allow the rain to drain off and keep the nest tubes dry. A box also helps to hold your tubes together and give them stability. I used a back board as well, which could be used to affix the different blocks of wood and keep the whole thing stable. One way to achieve the nest tubes is to use a drill and create various sized holes in the pieces of wood. These should be up-to 7 inches deep and vary in size between 2mm and 10mm. Different bee species like different sizes of holes, and producing a variety will maximise the chances of the hotel being used by a number of species. Larger holes, around 8mm, seem to be favoured by the leafcutter bees with smaller holes used by smaller mason bees and species such as the delightful harebell carpenter bee. It’s important to make the entrances to the holes smooth, by sanding or otherwise removing rough wood and splinters asd these could damage the wings of the bees. Another option is to use bamboo canes cut to the correct lengths – again taking care to avoid splintered edges. A variety of different sizes will similarly work for a range of species. Dead plant stems, especially those robust enough to maintain their structure such as hogweed, reed or nettle, can provide a ‘natural’ nest tube. These can be bundled together length-ways to create a tempting array of opportunities. With the box illustrated below, I opted for a combination of all of these materials which creates a pleasing arrangement – an important consideration if you are going to site this somewhere prominantly in your garden – as well as providing a diverse range of nesting opportunities. The bee hotel should be placed somewhere south facing, in full sun if possible. The key requirement is sun in the morning to allow the bees to warm up and start their day – like all invertebrates, they are cold blooded. You should also ensure that they are not shaded too much by vegetation, for the same reason. The video below is a selectively-speeded clip, taken over 15 minutes in realtime, of bees emerging tentatively as the sun warms the bee hotel in the morning. Whilst you can fit and forget, many will advocate that an element of management is in the best interests of the bees to secure the long-term value of the bee hotel. Whilst parasites and enemies are a natural part of the bee’s life history, the creation of durable, artificial nesting habitat with higher densities of nests than would occur naturally can affect the balance of parasite and host and result in the bees failing to successfully hatch out a new generation. I am no expert in this area and will defer to others for this advice. This website is a great resource for further and more detailed reading on how to make a bee hotel, and how to manage it. Some sources talk of bees vs. pests when discussing management and this is, to my mind, an unhelpful distinction. Where your provision of nest boxes is not significantly upsetting the balance between the bees and their parasites/predators, then the loss of some eggs and indeed some broods to species of parasitic wasp and flies which depend upon them for their own survival is entirely to be expected. A wild garden should have space for these as well as the bees – creating a habitat invites an ecosystem rather than a species in isolation. However creating a ‘sink’ for bees which are drawn to the nest box and then fail to raise a brood because of the density of paratises or the impacts of fungal attacks is not a desirable outcome. In this instance, the bees may have been better served by not creating the bee hotel in the first place. Cleaning out holes in wood; swapping bamboo tubes; and replacing dead stems is recommended by some, but you need to be careful in your timings and approach to ensure that your actions are not inadvertantly removing the eggs and larvae before they hatched. One obvious way to minimise some of the risks would be the creation of multiple, small bee hotels around your garden if possible, as this addresses many of the density issues and reduces the risk of entire broods failing in a given year! 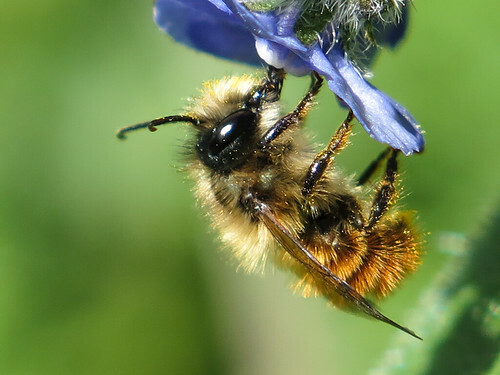 For more information about solitary bees – Ryan Clark has put together an excellent introduction to the species native to the UK in this Wildlife Trusts article. If you’re looking to identify solitary bees in your garden, this is a great place to start. If you begin to delve deeper, it won’t be long before you reach the work of Steve Falk who has produced the Field Guide to the Bees of Great Britain and Ireland – an indispensible book if you are looking to further your knowledge of our native species.